The new staircase from Mountain Avenue to Highland Gardens Park ('The Rez') only has a bicycle gutter on the left side. Usually, bicycle stairways are installed with the platform for the bicycle wheel on both sides of the stairs. This allows people who are right-handed to push their bikes up the right side of the stairs. If someone is left-handed, they can push their bike up the left side of the stairs. When going down again, people simply switch sides. All very easy! At the beginning of this year, the City of Hamilton decided to replace the crumbling and worn-out concrete stairway leading from the top of Mountain Avenue to Highland Gardens Park (locally known as 'The Rez'). On January 17, I was riding by the newly-installed stairway and did a massive double-take. 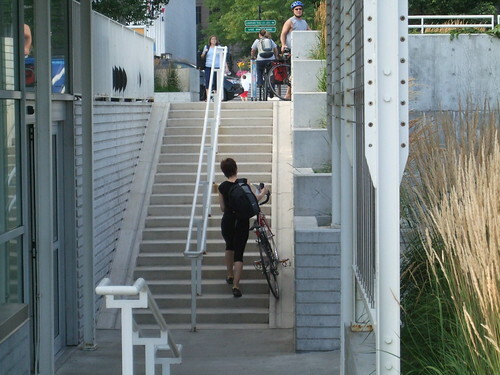 A left-handed only bicycle stairway! As we see in the photograph below, this particular set of stairs only has the gutter on one side of the centre railing. So while going up, it is necessary to hold and push the bicycle left-handed! As you can see, at the time I took the photograph there was still some construction fencing. So I gave the City the benefit of the doubt and considered that the stairs may not be finished, and the gutter on the other side might still be installed. On July 1, the Dominion Day holiday weekend gave me time to check this out again. Now, the construction is over and the stairway is finished. And it is still left-handed only. So I thought to myself, let's give this stairway a try. How hard is it for a right-handed person like me to push his bike up left-handed? It turns out that it is rather awkward and inconvenient. It is probably good for my moral development to experience what left-handed people go through all the time: stuff built backward for them. But infrastructure should be for everyone, whether right or left-handed. Now all you right handed people know what i deal with on a daily basis as a leftie. Finally justice! Amen! This is a godsend as a left handed person! ===== Minds are like parachutes - they work best when open. I saw this staircase last week. I wasn't so concerned with what side the gutter was on, but rather the fact that there is only 1. Why not do them on both sides like every other set of stairs in the city so people can go up and down at the same time? The image of your biking by and being appalled by, oh no, a bike gutter, is just downright ridiculous. AND The fact that you had to "go back" and look at it again only to have your head roll some more is so laughable. Regardless of what side the gutter sits on, its the exact same motion with your hands on the handlebars and your feet on the steps. If it's that big of a coordination issue for you I'm going to ask that you go back to the Rez on your day off and practice pushing your bike up and down. The new stimuli might be good for you. Left or right, it makes no difference. Really? This is what you are complaining about now? I'm an avid cyclist and am impressed with everything the city has been doing lately. Everything isn't perfect, but they are making progress and should be congratulated and encouraged to do more. If people keep complaining and finding fault with everything the city does, then eventually they may stop or slow down because they can't win for trying. To be honest, this entire blog has become excessively negative lately. There are things in Hamilton that need fixing and areas that could be improved but I am getting tired of the constant bitching and whining. You've lost a regular reader and subscriber. I'm happy they installed the new stairway and it is a vast improvement over the old. In fact the old stairs only had a handrail on one side, which is much more egregious than not giving two separate bike troughs. Usually I agree with what is written here w.r.t cycling safety and infrastructure but this feels a bit like nitpicking. Luckily in this case, the ride-able trail connecting the grass park to the road is a gentle grade and adds about 100-200m distance. Doesn't it being left or right handed depend on if you're going up or down? This is one of the most ridiculous things I've ever seen someone complain about. One other thing I just saw on this. It hasn't been called Dominion Day since 1982. It's Canada Day. What's with the use of a 35 year old name? We've moved on, maybe you can too? Actually, July 14 is called 'Fête nationale' in France ... Bastille Day is what foreigners call it. I don't know what you mean by "many of us", (emphasis on 'us', shows your disdain for anyone who doesn't agree with your globalist progressive views, yes you are too elite for the rest of us) at least not where I roll we never hear anyone say Dominion Day. Try getting out of a fair trade organic cafe once in a while. Dude: wrong stereotype altogether. Forget snowflakes hanging out at fair-trade, organic café; think crusty old men hanging out at the Legion Hall. My my how easy it is to offend snowflakes these days. Happy Canada Day... with your big words, likely learned from a decade of university degrees in Yoga and Womens' Studies. Wow, you are like a bad parody of a right wing Trump-head. "Snowflakes"? Srsly? ummm...just go up the other side and use your other hand. what a waste of 5 mins.